Cosmonaut Pavel Popovich is shown in a still picture during his Vostok 4 mission in August 1962. The sixth man to orbit the Earth, Pavel Romanovich Popovichdied Wednesday, five days before his 79th birthday. According to officials inRussia, his death came following a stroke at a hospital in Gurzuf on Ukraine'sCrimean Peninsula. "Pavel was a wonderful person," recalled firstwoman in space Valentina Tereshkova, in an interview with RIA Novosti. "A professionalcosmonaut, devoted to his work, and he was also a good friend." The first to be chosen among the Soviet Union's original 20cosmonaut candidates, Popovich was considered for the country's -- and world's-- first spaceflight, which was ultimately flown by Yuri Gagarin. Instead, heserved as capcom for Vostok 1, conveying commands between the ground andGagarin in space. Popovich's own first flight came more than a year later inAugust 1962 aboard Vostok 4. Originally slated for launch as much as ninemonths earlier, his solo orbital flight was re-planned in an effort to furtherthe Space Race, topping the planned efforts by the United States to launch JohnGlenn on America's first orbital mission in late 1961. Although he still launched alone onboard the one-seaterspacecraft, Popovich was not the only cosmonaut in orbit on August 12, 1962.Waiting for him was Vostok 3 pilotAndrian Nikolayev, who launched the day before, marking the first time twomanned vehicles were in space at the same time. Although they would come within about 3 miles (5 km) of eachother, close enough to see each other's spacecraft, their mission was not torendezvous, as was incorrectly assumed by press reports. The Vostok capsuleswere not equipped to maneuver. Instead, the tandem flights were aimed atlearning how to manage concurrent missions while further studying the effectsof extended spaceflight on the human body. 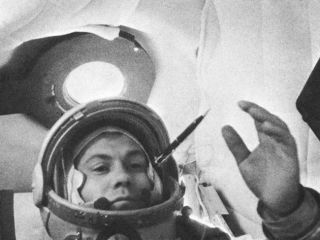 Nikolayev remained in orbit nearly four days, setting yet anotherrecord for the Soviet Union. Popovich might have also flown for four dayshad it not been for his Vostokfailing to maintain its interior temperature, leading to the decision to landafter three days. Popovich himself almost brought his mission to an early endwhen he reported seeing "thunderstorms," a pre-set codeword he was touse to signal that he was ill. While the ground scrambled in response, Popovichrealized his error and radioed to report that he was fine and had really seenlightning over the Gulf of Mexico. Popovich returned to Earth, ejecting from Vostok 4 andparachuting to the ground as was planned, on August 15, 1962. He successfullycompleted 48 orbits of the Earth. It would be more than a decade before he would return tospace, in large part due to the failed Soviet effort toward landing cosmonautson the Moon. Assigned to command one of the lunar missions, Popovich trainedfor the moon from 1966 through 1968 before being reassigned to fly to theSoviet Union's first military space station in the wake of the lunar program beingdisbanded. Popovich's second spaceflight was further delayed when itstarget, disguised by the civilian name Salyut 2, failed in orbit, losingpressure, flight control and eventually all of its power before reentering in1973. Finally on July 3, 1974, Popovich lifted off as commanderaboard Soyuz 14, a 16-day mission to what was the first Almaz manned militarystation, Salyut 3. Together with Yuri Artyukhin, Popovich tested the use of theoutpost as a reconnaissance platform using 14 different cameras. Popovich returned to Earth for the second and last time onJuly 19, 1974, logging a career total of just under 19 days in orbit as thefirst ethnic Ukrainian to fly in space. Popovich remained involved in space exploration beyond hisown missions. For nine years beginning in 1980, he served as deputy chief ofthe cosmonaut training center at Star City, Russia, where he had been the first toreport twenty years earlier. In the late 1980s, Popovich was appointed director for theRussian Institute for Land Ecosystem Monitoring, which develops remote sensingsatellites for land management and agriculture. "I was able to look out of my porthole a lot, and likeanyone who looks at the planet from space I realized -- I am convinced -- thatthe Earth is not the property of any one person or country," recountedPopovich for the 2007 book "Into That Silent Sea"by Colin Burgess and Francis French. "It belongs to us all." A decorated Major General in the Russian Air Force, he wastwice awarded as Hero of the Soviet Union. Popovich lived to see his name lentto an Antarctica mountain ridge and an asteroid. He is survived by his wife Alevtina Oshegova and twodaughters from a former marriage.